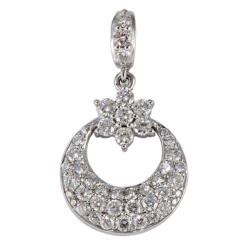 Made from excellent quality, multi colored Sapphires and beautiful White Diamonds, this pendant is truly a unique piece. The Sapphires have a total weight of approx. 1.01ct with 0.24ct of Diamonds. The Pendant and the chain are made from sleek 18kt White Gold.